At All‑Mont Garage Doors, we provide garage door repair and installation of all brands of garage doors and garage door openers offered on the market. Our team of experts provides home owners and property owners in the Orangeville, ON region with the best possible services and products. For your residential, commercial, industrial or agricultural orders, come see us and we will gladly guide you through your purchase of a garage door system. With All‑Mont Garage Doors, you will receive fast and friendly service. Our technicians are very good at their job and have mastered all aspects of a garage door repair, installation and maintenance. Why choose All‑Mont Garage Doors? We repair most brands of garage doors and garage door openers. You can schedule an appointment easily by calling us or using our online form. We serve Orangeville, Shelburne, Dundalk, Caledon, Bolton, Palgrave, Tottenham, Brampton, Mississauga, and Toronto. We look forward to serving you! Your garage door is equipped with an opener which is either operated by a chain drive (like a bicycle) or a belt drive (made of rubber reinforced with metallic threads). These two types of garage door openers work very well. However, the chain opener requires a bit more maintenance, because it has to be lubricated at least two times a year. 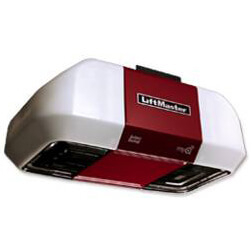 At All‑Mont Garage Doors, we use LiftMaster brand garage door openers because they are reliable and offer excellent performance. 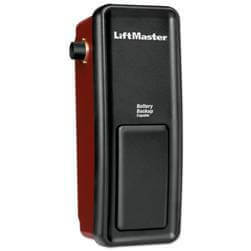 If over the years, you run into a minor problem with a garage door opener, it is likely that it's because of a misalignment, an obstruction of the photo‑electric sensor system or because the radio transmitter has low batteries. Be assured that our expert technicians recognize these situations easily. The auto-reversal mechanism (when the door is descending) is one of the most important features of a garage door opener. It works based on two safety mechanisms. The first is mechanical: when an object hits the bottom of the door, the door reverses automatically. The second one is photo‑electric: when something passes in front of its beam, the door being lowered immediately goes up again. This means when the door opener detects that a person or object is in the door's trajectory, both mechanisms must be working at all times. It is therefore important to have these reversal mechanisms verified at least two times a year. Don't trust in simply having a door opener to open and close your door. Be aware that a door opener can easily lift 100 kg (225 lb), but will also push 100 kg towards the floor. Because of this, these mechanisms must always be in good condition so that they work well and so that you can avoid problems in the case of an emergency. For example, in the event of a power outage, if your garage door opener is not equipped with an emergency battery, you will have to go inside your garage and use the emergency opening mechanism (red cord) to be able to open and close your door. Call All‑Mont Garage Doors for all your garage door and opener needs in Orangeville, ON. Our team will come quickly to your home to check out your garage door system, identify the cause of any problems and offer an efficient solution. We also offer a preventive maintenance program, which includes an annual tune‑up of your garage door system to ensure its optimal functioning for as long as possible. For our maintenance or repair services, get in contact with us immediately at 1-800-957-5865!